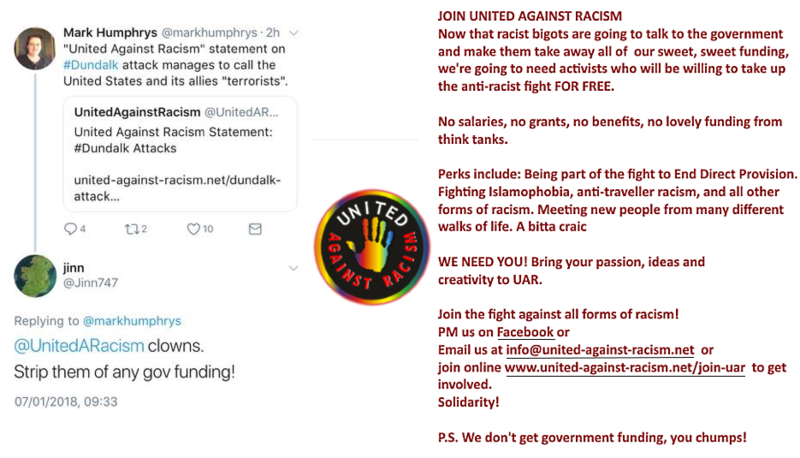 Libellous far left group United Against Racism (UAR) (and twitter and facebook) calls everyone "racist". "United Against Racism" hates Israel. UAR supported a protest against an Israeli football match in Sept 2016. UAR supported an anti-Israel march in June 2017. 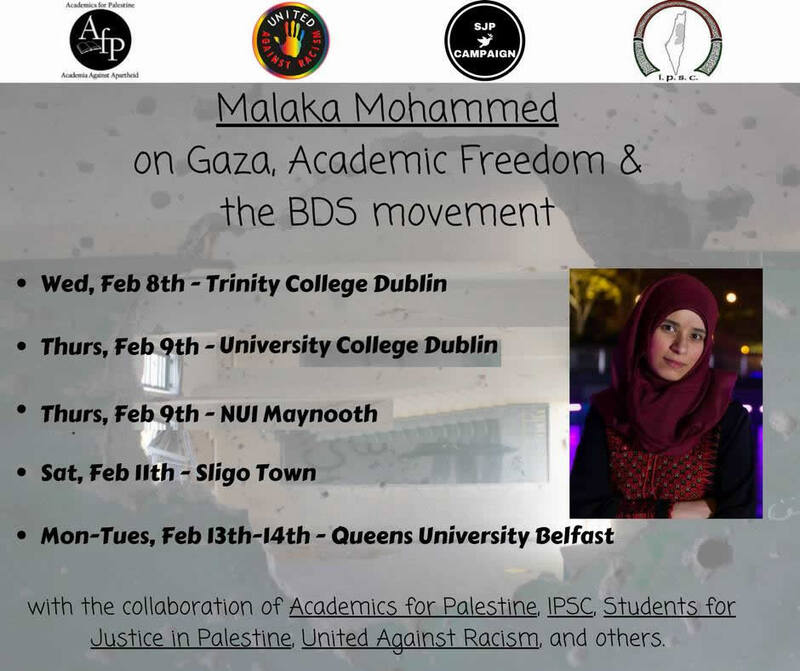 It was involved in Feb 2017 in this anti-Israel speaking tour by Exeter PhD student Malaka Shwaikh (also known as Malaka Mohammed). 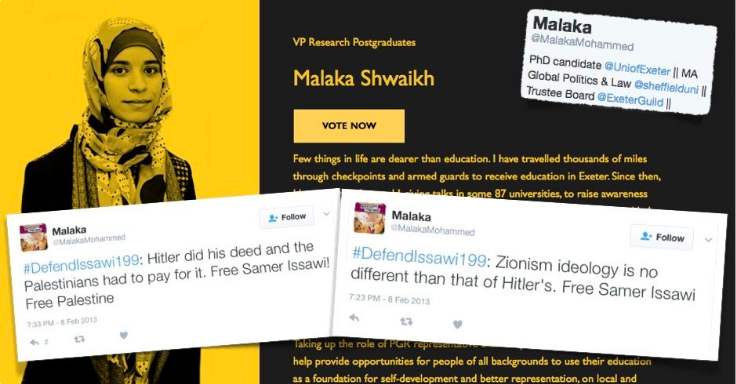 Who is Malaka Shwaikh (Malaka Mohammed), whose speaking tour "United Against Racism" sponsors? Here are some tweets by her. From Campaign Against Antisemitism, 17 Feb 2017. Tweet by Malaka Shwaikh (Malaka Mohammed). From Campaign Against Antisemitism, 18 Feb 2017. United Against Racism, Jan 2018, issued an absurd statement on the Dundalk attack in which they managed to call the US and its allies "terrorists" while questioning whether jihadi attackers are. "The bombing of civilians in the Middle East by the United States, Russia and others is not considered to be terrorism, but knife and van attacks by disturbed individuals are ... it is the United States and its allies who have a monopoly on who gets labelled a terrorist. ... the overwhelming majority of violence is inflicted by powerful states that serve the interests of the wealthy ... In the Middle East, the majority of the violence is inflicted by the bombs of imperialist powers." I slagged off the United Against Racism statement on Dundalk, Jan 2018. In response, United Against Racism implies I am a "racist bigot". 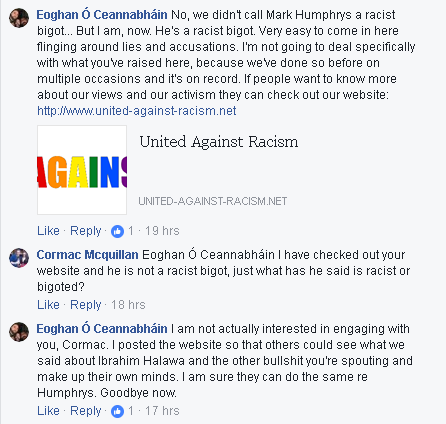 In the thread above, United Against Racism spokesman Eoghan � Ceannabh�in (see twitter) specifically libels me as a "racist bigot". 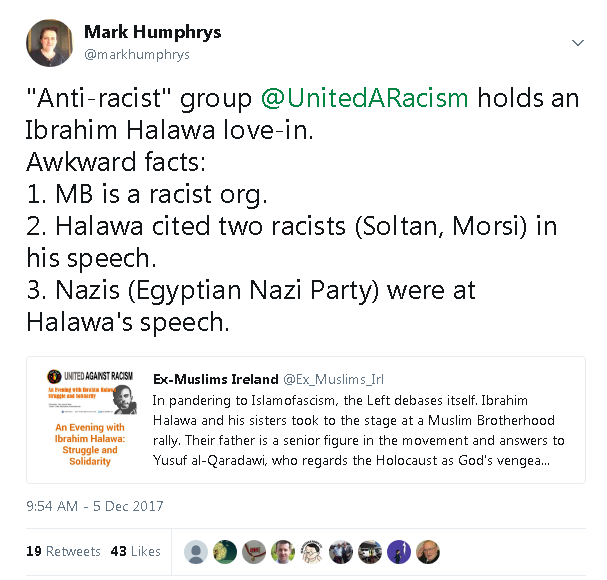 United Against Racism might be angry because of this tweet of mine about the Halawa case in Dec 2017. But instead of replying to it, and addressing my 3 facts, they just call me "racist". 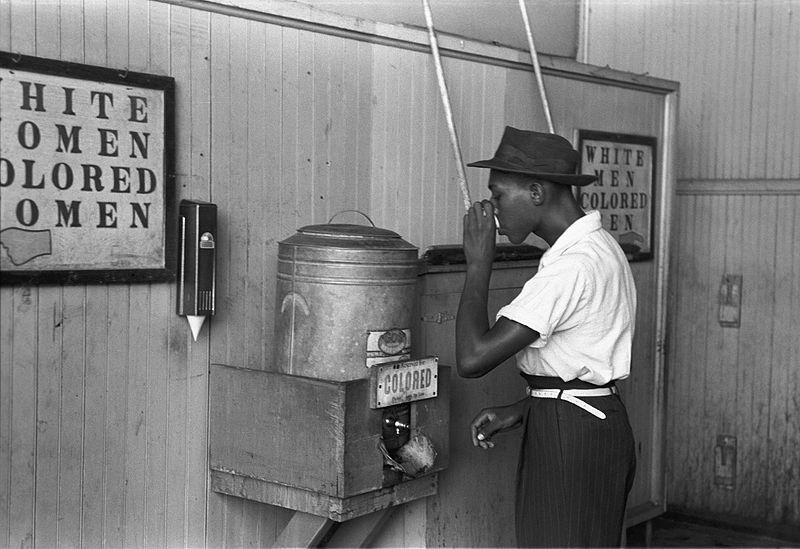 The word "racist" used to have a specific meaning. Now it just means: "a white person that a leftist disagrees with". It is not progress to drain such a profound word of meaning. Return to The Irish left (groups).